Marvel Announces Defenders Comic with Netflix Line-Up! Marvel comics has announced a new volume of The Defenders – written by Brian Michael Bendis and with art by David Marquez. The ongoing title will feature the line-up we are soon to see on Netflix – Daredevil, Luke Cage, Iron Fist and Jessica Jones – but is based on a set-up from the final pages of canceled title, The New Avengers. ‘ We’ve been planning this book for well over a year and we’re so excited to show you what we think the next phase of the gritty marvel streets will have to offer,’ said Bendis. The Defenders #1 will be in stores in June. Further details follow the break. After a Decade Jessica Jones Returns To Four-Color! Brian Michael Bendis and Michael Gaydos – who worked together on the Alias comic book series that inspired the Jessica Jones Netflix series – are bringing the super-powered private eye back to Marvel Comics. Jessica Jones #1 will be in stores in the fall – bringing Jones back as a person whose world is in a far different place. As mother of Danielle, her daughter with Luke Cage, Jones’ perspective has changed, but even so, there’s a lot going on in her life. 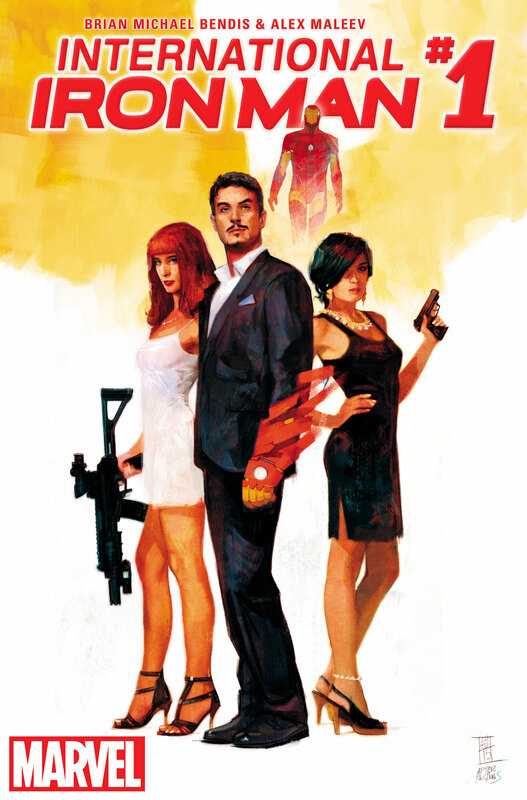 Iron Man goes global from Brian Michael Bendis and Alex Maleev. All-new series to be translated to reflect the languages of select countries worldwide.